"The Search for Moviegoers Living in New Orleans"
Click on the images above to see a larger view. 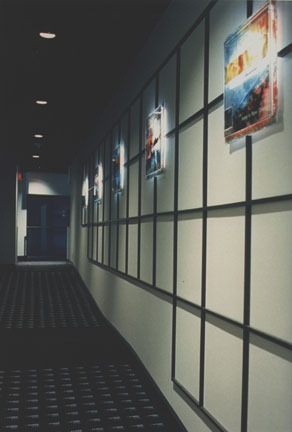 Commissioned by Landmark Theater Corporation, a series of five lightworks were created for permanent installation in Canal Place Cinema in New Orleans. Each lightwork consists of five acrylic layers, ranging in size from 18"x18" to 24"x24", bolted together and inset so as to emerge from a lighted recess in the wall. The images are composed of clear film positives that are suspended over rice paper colored with acrylic glazes. For both architect (Brooks Graham of Graham-Little Studio in New Orleans) and artist, an important criteria for the project was that it should be relevant to its place and time; it must be a theatre that is Somewhere-- New Orleans-- and not Anywhere. Designed as stills from a hypothetical film of Walker Percy's novel The Moviegoer, these layered primary and ghost images function as signifiers of New Orleans life and its limitations. The sequence of locales-- Lake Pontchartrain, buses on Elysian Fields Avenue, the swamps, St. Charles Avenue streetcars, the Mississippi River-- are derived from the geographical movement within the novel, and reflect the familiar design eccentricities of the city. The bronze women and children cemetery dwellers of the "film within a film" band along the bottom of the pieces establish an underlying visual narrative on mortality and its inevitability-- a theme common both to the novel and to this haunted city whose residents are accustomed to living next door to their own dead. Echoing the glowing technicolor and transparency of the movie screen, these images certify both their own existence and the hazy distinction between fiction and truth, facade and reality, past and present, that is peculiar to New Orleans.